One peculiarity of my work is that I can see and reflect on the fruits of my labor anytime I want, but I’m rarely in a position to take credit for it in the public eye. In most cases, I welcome the anonymity. After all, I’m in the business of nudging my clients and their ideas into the limelight, not in calling attention to myself. So, in the throes of editing Stand Out: Design a Personal Brand, Build a Killer Portfolio, and Find a Great Design Job (Peachpit Press: 2016), I was flattered and delighted when author Denise Anderson invited me to add my voice (and my name!) to Chapter 16, which offers wisdom from experts for student designers who must learn how to perform successfully in a professional work environment. Having an abundance of profound ideas on this topic, I happily accepted the challenge. 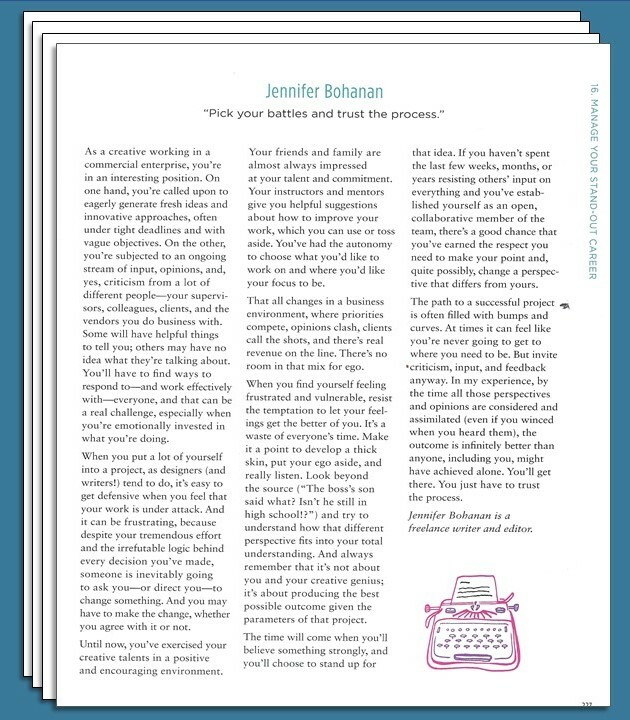 The assignment was to answer the question, “What advice would you give students and young designers on how to manage a ‘stand out’ career?” This excerpt, found on page 227, is my contribution.